1. Apricots, medium-sized fruits, around 10. 2. Cardamom powder, 1 teaspoon. 3. Light brown sugar, 1 to 1-1/2 cups. The method for cutting an apricot is the same as for cutting a peach or nectarine. Go along the edges with a knife, open the fruit and remove the pit. Chop the fruit into small pieces. I have kept the skin intact, if needed, they can be peeled. 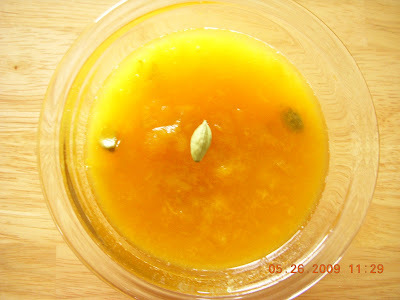 Take a pot and add the apricot pieces along with 1 cup of water and the cardamom powder. Let it cook under medium flame for 10-15 minutes until the fruit gets mushy and starts to thicken. Add the light brown sugar and mix well. Let it simmer for 2-3 minutes and switch off the stove. Serve the pachadi with rice, rotis or it can be used as a topping for ice-cream. I have not used tadka here. If tadka is preferred, heat a small pot with one tablespoon of oil. When the oil gets hot, add ¼ teaspoon of mustard seeds and let it splutter. Then add 1 sprig of curry leaves, 2 red chilies and fry everything for a few seconds. Pour this over the pachadi, mix well, and enjoy.